Scanning probe microscopy (SPM) is often used in production and research for characterizing properties and surface roughnesses of different material samples. An example of SPM application in industrial research and development is surface roughness measurement is performed for the quality control of glass media samples or heat-assisted magnetic recording (HAMR) products in the data storage industry. 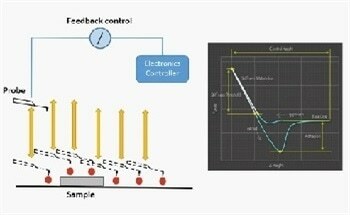 However, to determine the reliability of final products in semiconductor production, it is essential to perform surface quality control after chemical mechanical planarization (CMP). 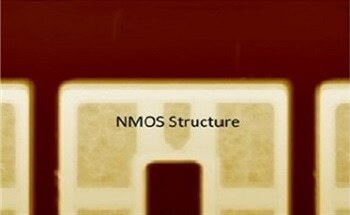 Nanometer scale roughness of production wafers is essential in integrated circuit (IC) manufacturing for device patterning. Gaining a better insight into the physical properties of the sample surface at nanoscale is necessary in all of these applications in order to understand failure mechanisms in the end product and to maintain overall reliability. 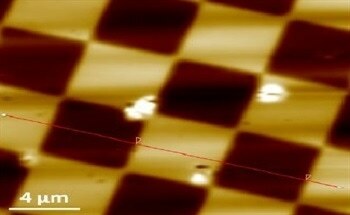 Due to its sub-nanometer level resolution in Z direction, AFM plays a significant role in the measurement of nanoscale surface roughness. In order to maintain consistency in measurement and preserve tip life, attractive state oscillation imaging or non-contact (NC) mode is essential. Although NC mode was the first dynamic force microscopy mode, it was hard to maintain the tip consistently in attractive state oscillation due to lack of high bandwidth Z-actuator. Repulsive state oscillation, also known as dynamic mode, was used as an alternative. Dynamic mode is often used with high oscillation amplitudes, resulting in limited tip life. As the data relies heavily on tip sharpness, the data measurement lacks repeatability. 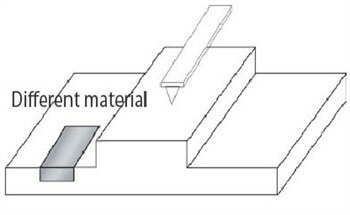 The surface roughness measurements are significantly affected by blunt tips, as the surface feature size becomes smaller than or comparable to the effective tip radius. Park Systems pioneered manufacturing of commercial AFM systems. The company focuses on performing NC mode imaging with high bandwidth Z-actuators and decoupled XY and Z scanners. This article discusses the improvements made in AFM imaging for sub-angstrom surface roughness measurement and repeatability by employing Park NX series technology. When performing amplitude modulation NC mode imaging, the frequency of the cantilever oscillation must be selected at a level slightly larger than the resonance frequency of the cantilever. This frequency selection is based on the fact that the cantilever resonance frequency increases when the cantilever oscillates in attractive state based on the tip-sample separation. The phase of oscillation for a sharp clean tip in attractive state is negative in Park’s AFM systems. 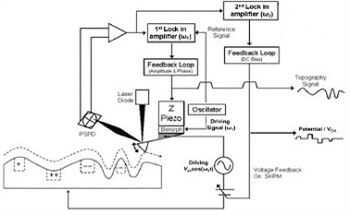 The actual sign and value of the phase signal differs according to system manufacturer. The cantilever oscillation amplitude is impacted by the tip-sample interaction forces when the Z stage is approaching the sample surface. Figure 1 shows an experimental amplitude displacement (A-d) curve exhibiting this behavior. The oscillation amplitude is measured in this curve when the tip approaches towards and then retracts from the surface of the sample. While the tip-sample separation decreases (red curve), the tip-sample interaction remains in NC or attractive mode until a jump in amplitude takes place and this interaction transitions to a dynamic mode or repulsive state. The tip immediately transitions from repulsive to attractive state when the tip withdraws from the surface (blue curve). As a rule of thumb, this transition generally takes place when the tip-sample separation is almost between half and three quarters of the cantilever’s free oscillation amplitude. This transitional behavior between dynamic and NC modes is visible as a hysteresis loop in the plot and creates a bistable state. The phase curve also exhibits a corresponding hysteresis loop. In the phase hysteresis loop, phase values transition between negative (NC mode or attractive state) and positive values (dynamic mode repulsive state). Figure 1. AFM cantilever oscillation amplitude (upper) and phase (lower) vs. tip-sample separation (d) known as A-d curve for constant Z actuator driving power. Tip sharpness can also have an impact on the amplitude curves. Three sets of phase and amplitude curves, representing sharp, normal, and blunt tips, are shown in Figure 2. The tip sharpness is validated by scanning a 70 nm grating. The ability of the tip to accurately resolve the gratings is limited when it becomes blunt, while the attractive state region becomes slightly wider. For a normal tip it is easier to maintain the tip in an attractive state as this state is wider. The phase and amplitude curves are not inclusive of the bistable state hysteresis loop for a blunt tip and the phase can reach high negative values. Figure 2 demonstrates that the amplitude curve can be used as an estimated tip quality/sharpness characterization tool. Figure 2. Plots on the left show representative A-d curves (plots of cantilever oscillation amplitude and phase vs. tip sample separation) for sharp, typical, and blunt tips. The plots on the right side are the corresponding profiles of a calibration grid collected with each tip. NC mode imaging has the benefits of maintaining measurement consistency and preserving tip life. It has been very helpful to measure sub-angstrom level roughness values, especially for bare silicon wafers. However, in certain cases the performance of the NC mode may be limited when measuring samples with small roughness values (<2 Å). The image resolution in these conditions drops and the quality is poor. The presence of a liquid layer on the sample surface (such as when the scan occurs in ambient air) could be the cause of this. The tip cannot precisely track the surface features in an attractive state if the thickness of the liquid layer is similar to the feature size. To overcome this problem, the tip must oscillate in the repulsive state. 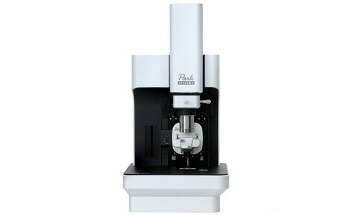 This enables the tip to penetrate the liquid layer and reach the sample surface (contact). A hard drive glass media sample is imaged using both dynamic and NC modes to demonstrate this phenomenon (Figure 3). 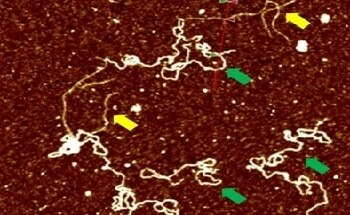 In this image the sample was initially imaged by employing the NC mode with the cantilever oscillation amplitude set to 10 nm. Despite the acceptable tip sharpness, the image quality is not desirable. Imaging was performed again using dynamic mode with oscillation frequency smaller than the free air resonance frequency (f0). The quality of the dynamic mode image is better than that of the initial image. NC mode was used to image the sample for a third time, with the cantilever oscillation frequency larger than f0. The failure of the tip to reach the sample surface was confirmed. Figure 3. 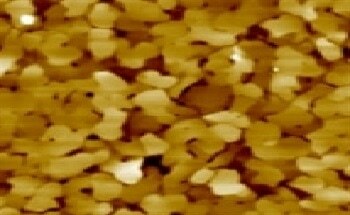 Imaging sample surface with angstrom level roughness, as it is covered with a liquid layer. The images were collected as the tip-sample interactions were a) attractive, b) repulsive, & c) attractive again. Dynamic mode imaging is traditionally performed with large amplitude oscillation of >20 nm. Applying more energy to the cantilever enables larger amplitude oscillation, allowing the tip to “contact” the surface of the sample. In addition, the bandwidth of the Z servo of the AFM system and system noise level limit the ability of the AFM systems to execute dynamic mode imaging with low oscillation amplitude. The tip life can be preserved for longer and its effect on measurement repeatability is reduced if a system can perform dynamic mode with low amplitude. This is done by applying the minimum energy to the cantilever needed to penetrate the liquid layer. The Park NX series was developed to perform low amplitude NC mode imaging, making it possible to perform low amplitude low energy cantilever oscillation with the maximum signal-to-noise ratio. This type of dynamic mode (with low oscillation amplitude) is called soft dynamic (SD) mode. A comparison between the tip life in normal dynamic mode (high amplitude) and SD mode (low amplitude) by scanning a glass substrate sample with a roughness value of approximately 1Å is shown in Figure 4. The 1st and 50th images, scanned using normal dynamic mode, are compared in the two upper images of this figure. The 1 µm x 0.25 µm images (512 x 128 pixels) are collected with a scan rate of 1 Hz. Over 50 images, the roughness value (Ra) drops by 6%, and the loss of tip sharpness results in the image resolution degrading. The comparison between the 1st and 1000th images collected using the same tip in SD mode is shown in the two lower images of Figure 4. There is a mere 2% decrease in the roughness value over the 1000 images and the high image resolution is well-preserved until the last image. SD mode imaging is performed by employing the fast Z servo feedback. SD mode clearly outperforms normal dynamic mode in terms of measurement consistency and tip life despite the gradual tip wear. Figure 4. Repeatability test using conventional (upper) and low amplitude soft (lower) dynamic mode on glass substrate. Tip-to-tip correlation is another significant aspect of measurement consistency. Eliminating tip dependency in the measurements is desirable to obtain true sample surface property by AFM roughness measurement. The 1000 image roughness measurement test was performed with three different tips for this purpose. Figure 5 shows the variations in roughness (Ra) over 1000 scans for all three tips. The inset table shows the average and standard deviation of the data set for all tips. 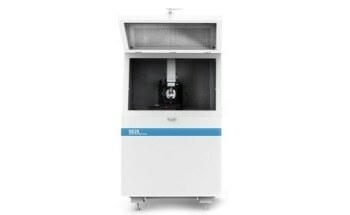 It can be seen that in case of the sample with an Ra of 1 Å, the repeatability measurements demonstrate variations of less than 0.03 Å (below 3%). This minimal variation indicates tip independency of roughness measurements using SD mode. Although measurement variation is small (<3%), the source remains unknown. Three sets of roughness measurement on various positions on the HDD glass media are shown in Figure 6. 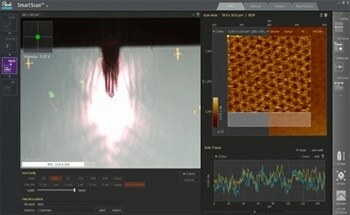 1 µm x 2 µm images with resolution of 512 x 1024 pixels are captured at scan rate of 1 Hz in SD mode at all locations. In order to be comparable with images captured for Figure 5, each image was divided into eight 512 x 128 pixel sections and the Ra values were calculated for all sub-images. The Ra variation on the surface of the sample from location to location is approximately 3%, which is similar to the variation seen in Figure 5. One possible source of the variation seen in Figure 5 could be due to point-to-point variation on the surface of the sample. Figure 6. Roughness measurement images at different locations on sample surface. 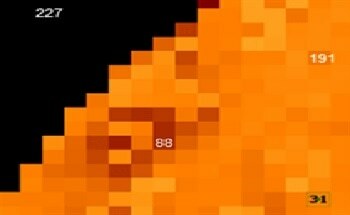 The roughness values show around 3% variation from location to location in 1 µm x 0.25 µm. This article introduced SD mode imaging as an alternative technique for sub-angstrom surface roughness measurement by employing low amplitude, low energy cantilever oscillation with Park NX series. 1000 roughness measurements were performed using a single tip with SD mode. Less than 3% variation was observed while the tip sharpness and image resolution is preserved. This variation is the same as the variation of roughness over various locations on the surface of the sample. Considerable tip-to-tip correlation with 3% variation was shown to exist by repeating the 1000 scan test with two extra tips. SD mode imaging is performed using the high speed feedback system and large bandwidth offered on the Park NX series AFMs. Various industries including semiconductor manufacturing and hard drive media can use this solution for research and production. G. Binnig, C. F. Quate and C. Gerber, "Atomic Force Microscope," Physical Review Letters, pp. 930-933, 1986. R. Garcia and R. Perez, "Dynamic atomic force microscopy methods," Surface Science Reports, pp. 197-301, 2002.